Like I said in my last post, one of my life themes is love. So I've always loved Valentine's Day. It's really fun when you're in elementary & middle school because it's a holiday full of candy, Disney-themed Valentine's Day cards, designing mailboxes for all of your fan mail, and lots of pink and red decorations. In college, it's a little different. Some people will spend the day/night with their fiancé or boyfriend/girlfriend, some with friends, some with family, and some alone. People seem to focus on romantic love during Valentine's Day, but I think it's a holiday to recognize all of the people you love, including yourself. Self-love is a love that many people my age (and of all ages) struggle with in our society. 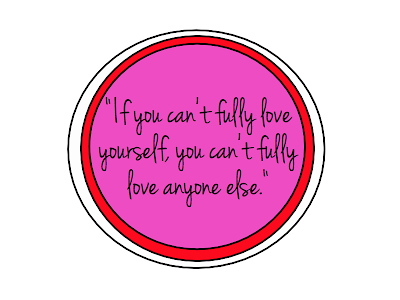 One of my favorite quotations is, "If you can't fully love yourself, you can't fully love anyone else." I think so many people have difficulty showing their love for others, saying "I love you" and meaning it, and really investing in other people because they can't do these things for themselves. Take some time today, or all this month to show yourself some love. Treat yourself to some relaxing time, encourage yourself to try something new, appreciate the person you are, be proud of the person you are, and really truly love yourself. Others will do the same. Happy valentine's day Dear ! Love this post ! This is so true! Happy valentines day!